Simple stool-based diagnosis could be a global lifesaver by enabling millions more children at risk from TB and MDR-TB to be tested. Thursday, 25 October 2018, (The Hague, The Netherlands) – A simple method for processing stool samples for Xpert MTB/RIF testing using minimal equipment could enable the identification of thousands of children with tuberculosis (TB) and multidrug-resistant TB (MDR-TB) disease – drastically reducing the numbers of children under five dying from TB. The ‘stool test’ was developed by KNCV Tuberculosis Foundation (KNCV) and announced at the 49th Union World Conference on Lung Health. Currently, an estimated 233,000 children die every year from tuberculosis (TB) Children with TB rarely die when they receive standard treatment for the disease, but 90 percent of children who die from TB worldwide went untreated. Stool sampling has in recent times been under investigation but it has been widely considered that stool is a difficult sample, because it contains so many other bacteria and debris, and it is believed that the Mycobacterium tuberculosis bacilli are fully “encapsulated” by other materials in the sample, making it difficult to “free” the bacilli. It was previously believed that good quality DNA material could only be obtained from stool in multiple cleaning steps using sophisticated equipment. 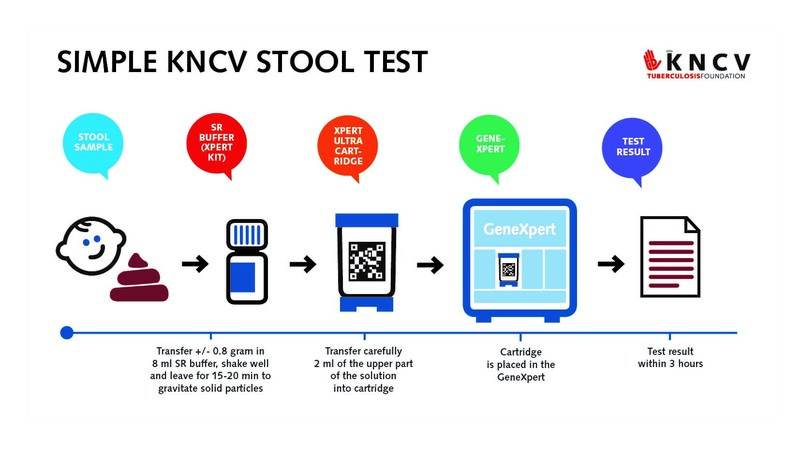 The new simple method developed by researchers at KNCV involves mixing a sample of stool with a sample of the SR (Sample Reagent) buffer (which comes with every Xpert machine cartridge in bottles of 8 ml). This simple Xpert stool test was positive (showing TB) in all children who also had positive respiratory samples – there were no false negative stool samples. The work was done in collaboration with Ethiopian and Indonesian research institutes, and the respective national TB control programs. The test also identifies resistance to rifampicin which is a marker for MDR-TB. Currently, to obtain a sputum test, children are referred to specialized service providers, as testing is not possible at the community level. Additionally, current stool processing methods use sophisticated centrifugation and filtration that are only available in referral laboratories, usually attached to referral hospitals. The diagnosis of pediatric pulmonary tuberculosis (pTB) is difficult and often relies on clinical signs and symptoms, as obtaining respiratory specimens for testing of young children is challenging. GeneXpert MTB/Rif can be applied on stool samples for diagnosing pTB, but until now, this method is not routinely implemented due to the complexity of the available processing methods. 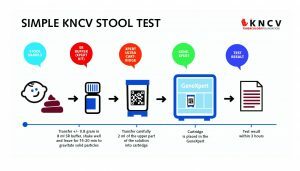 Petra de Haas, Laboratory Advisor at the KNCV Tuberculosis Foundation in The Hague, The Netherlands, reported on a simple method for processing stool samples for Xpert MTB/RIF testing using minimal equipment. This method was tested in vitro using TB-negative stool samples from children in Ethiopia, and on stool samples from 36 children with presumptive pTB aged<15 years in a tertiary care hospital in Bandung, Indonesia. From these children, respiratory samples (RS) were also obtained by gastric aspiration for children aged 5 or below and by sputum induction for older children and tested with Xpert for comparison. The in vitro tests showed the potential of the method; using a very simple method, omitting homogenization and filtration steps, reliable results were obtained and no significant inhibition of amplification, a critical step in the GeneXpert process, was observed. The median age of the children with presumptive pTB was 17 months (interquartile range: 5.5-78 months). pTB was diagnosed among 6 of them (17%); 27/29 submitting stool and RS had an interpretable test result on both samples, the results being concordant in 24 (89%, 95% confidence interval: 71-98%). The three children with discordant results all had an MTB-positive result on stool only. This groundbreaking work shows that a simple and low-cost method, using similar processing steps as are applied for sputum, can diagnose TB at any GeneXpert site using stool samples, and can even diagnose additional children. The method has the potential to make a bacteriological diagnosis of TB in children at the lowest levels of health care.